When one kinship dies, another comes to life. 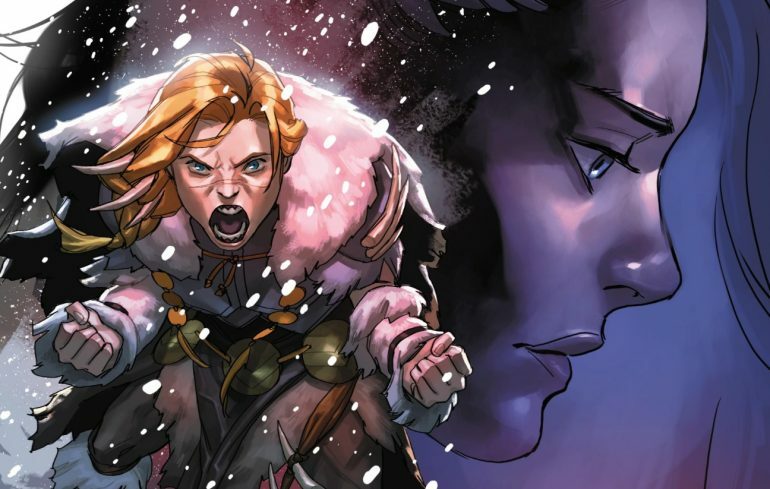 Released in collaboration between Riot Games and Marvel Entertainment, the fourth and final issue of “Ashe: Warmother” is out now, wrapping up the comic series with a fight between sisters and a journey to the impossible. The first issue of the comic series served as an introduction to Ashe and her home tribe in the Freljord. In the second issue, Ashe continues her mother’s quest to unearth Avarosa’s throne, where she finds her bow made of True Ice. The bow comes at a cost, however, and Ashe is cast out into the wilderness tribeless and without a place to call home. Part three introduces Sejuani as on old friend of Ashe’s after the two run into each other following a skirmish with a Grellfeen. The duo venture back to Sejuani’s tribe together, but Ashe’s fate falls into question as the Winter’s Claw’s Frost Priests plot her demise. The comic’s fourth issue picks up where the third left off, revealing the inner turmoil of the Winter’s Claw tribe. Readers discover the Frost Priests have been manipulating the tribesmen and feigning fidelity as they nurture the cult-like loyalty of their people. The priests, ready to strike down the outsider, use this power to try to turn the rest of the tribesmen against Ashe, but Sejuani puts a halt to their efforts. Sejuani and Ashe make a blood oath to become Battlesisters, swearing to protect and stand by each other in times of war. It doesn’t take long for the oath to come into question, however, as Sejuani, Ashe, and a group of tribesmen set off to raid a neighboring tribe. When the group set fire to the neighboring village, Ashe counterattacks and pleads with Sejuani to show mercy by giving the victims a chance at survival on the Ice Sea. Sejuani eventually caves into the request and agrees, but she and her tribesmen leave the bow-wielding hero with a warning—shall they meet again, more blood will be spilled. With eyes on the horizon, Ashe then takes the victims of the attack and sets out on the sea with her new tribe in hopes of building a better life.